One of the best in a series of brilliant “unplugged” programs. An astounding array of Broadway singers triumphantly performed without any electronic assistance at Scott Siegel’s Broadway Unplugged 2015 at the Town Hall. All were terrific. Several were magical. Most pre-1960’s shows were unamplified. The act of listening was different then. Technology has changed all that. Some believe performances are more nuanced today. Others miss the excitement of hearing “real” voices. Whatever one’s opinion, Scott Siegel assembled a program that clearly showed what we’ve been missing lately. Starting with tenor Bill Daugherty’s “Before the Parade Passes By” (Herman), each song was revealed in new ways, including several that were written expressly for electronic treatment such as two songs from the Rock and Roll musical Jesus Christ Superstar (Lloyd Webber/Rice). Unamplified, Jeremy Kushnier’s “Heaven on Their Minds” and Farah Alvin’s “Gethsemane” humanized their outsized characters (Judas and Jesus). Jeffry Denman sang and tapped through two numbers: “What Do I Need with Love?” (Tesori/Scanlan) and “Bounce Me, Brother, With a Solid Four” (Raye/Prince), the latter with Caliaf St. Aubyn, displaying consummate command of style. Somehow Jimmy James Sutherland’s tap routine to “My Favorite Things” (Rodgers/Hammerstein) turned that twee ditty into a jazzy classic. John Easterlin and William Michals gave operatic heft to “Softly, As In a Morning Sunrise” (Romberg/Hammerstein) while Michals soared in “Stranger in Paradise” (Borodin/Wright/Forrest), finding all the beauty in that classic melody. Opera was also represented by “The Ice Cream Sextet” from Street Scene (Weill/Hughes), sung by an effervescent Easterlin taking on all the roles. 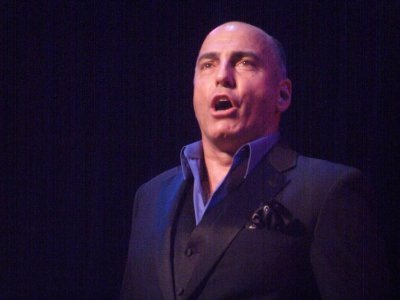 Keeping with the opera theme, Christopher Johnstone turned “The Music of the Night” (Lloyd Webber/Hart) into an aria. Several numbers were extraordinary and goose bump-making. Cheryl Freeman’s “I Know Where I’ve Been” from Hairspray (Shaiman/Wittman) was heartbreaking. “Back to Before” (Flaherty/Ahrens) took on an inadvertent meaning as sung by a very, very pregnant Jenny Powers. Vivian Reed blasted “Believe in Yourself” (Smalls) to the rafters as did Jeannette Bayardelle in “And I Am Telling You I’m Not Going” (Krieger/Eyen), practically turning herself inside out. Carolee Carmello’s “Don’t Rain on My Parade” (Styne/Merrill) was ferocious. A last-minute participant, Quentin Earl Darrington, unleashed his powerful bass on a glorious “Stars” from Les Miserables (Boublil/Schönberg). 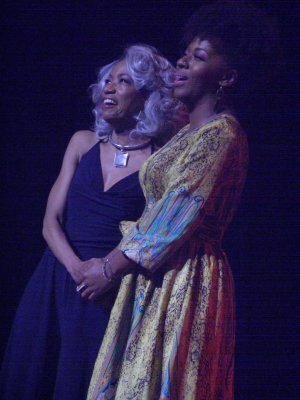 The emotional apex, though, was a mother/daughter duet, “For Good” from Wicked (Schwartz) sung by Adriane Lenox (who also got ovations for her “Stormy Weather” – Arlen/Koehler) and Crystal Joy. There wasn’t a dry eye in the house as these two embraced at the end of that wonderful song. The lineup was completed by Erin Davie (“My White Knight” – Willson), Molly Pope (“I Can See It” – Schmidt/Jones) and Stephanie J. Block brilliantly re-creating “ The Writing on the Wall” from her recent run in The Mystery of Edwin Drood (Holmes). The brilliant Ross Patterson led Randy Landau on bass and Mairi Dorman-Phaneuf on cello in his expressive arrangements ranging from jazzy to classical. 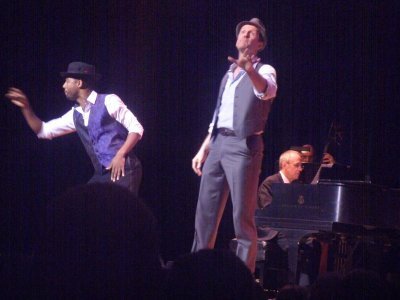 The Broadway performer delivered an eclectic concert of standards, show tunes, pop, and even Lady Gaga, with revealing autobiographical patter. This funny and entertaining improvisational murder mystery is based on Mad Libs and is performed by a rotating cast of lively NYC notables at a cabaret. Arthur Laurents’ revised version of his problematic musical on the history of the civil rights movement still seems like shorthand but actress Stephanie Umoh gives a sensational performance.